You are offered ten stacks of coins, each stack containing at least a dozen coins. 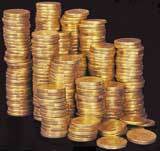 Nine stacks are only gold coins that weigh 1 gram each. But the coins in one stack are false and weigh 1.1 grams. You may use a balance that gives the exact weight in tenths of grams. But this balance has one problem: it can be used only once. Can you find out (in one weighing) which stack consists of false coins?